Published: June 5th, 2018 by Simon. Filed in Kitchen and tagged Contemporary, kitchen design. Kitchen renovations are one of the most common home improvements in Perth. While some homeowners renovate to adapt to changing lifestyles, others do so to change the style and look of their kitchens. In fact, Houzz’s 2018 Kitchen Trends Study states that 82% of all homeowners renovated their kitchens last year to change the style of their space. If you’re also looking to renovate your kitchen, then you should also consider changing the style of your kitchen in the process. Changing your kitchens’ style will not only make it look more attractive, but it will make it more functional as well. So, which kitchen style should you opt? While there are several kitchen styles to choose from, in my opinion, it comes down to just three. Today, I’ll discuss these styles in a little more detail. So, continue reading to discover the three most popular styles of kitchens in Perth. Choose any of these styles to make your space trendy and functional. Contemporary kitchens are by far the most popular style choice for kitchens in Perth. According to Houzz, 29% of homeowners who renovated their kitchens last year upgraded to a contemporary kitchen. Homeowners between the ages of 35 and 54 are most likely to choose contemporary kitchens over other styles. Contemporary kitchens make use of elements from traditional and modern design to create a streamlined look with high functionality. They are often styled to offer a clean and sleek feel, and they are incredibly liveable. If you’re considering upgrading to a contemporary kitchen, use a combination of stainless steel and white appliances. Remember to keep things minimalistic and use a mix of traditional and modern fittings and accessories to achieve the look. And, for all products that you need to create contemporary kitchens in Perth, look no further than us at Ross’s Discount Home Centre. We offer a huge range of kitchen products that will allow you to design the contemporary kitchen of your dreams! Modern kitchens are the second most popular style choice for kitchens in Perth. According to Houzz, 26% of all homeowners who renovated their kitchens last year upgraded to a modern kitchen and many homeowners between the ages of 35-55 upgrade to modern kitchens. I often meet customers who think that contemporary kitchens and modern kitchens are the same. However, there is a subtle difference between the two. Modern kitchens are sleek and minimalistic and include fittings and accessories that make it functional. On the other hand, contemporary kitchens include ornamental and traditional elements along with elements from modern kitchens. If you’re thinking of updating your kitchen style to a modern kitchen, remember to keep things simple and functional. Use neutral colours and choose sleek accessories and fittings. Modern kitchens rely on simplistic beauty – make sure to keep this in mind when you renovate. Again, for all your kitchen product needs, consider us at Ross’s Discount Home Centre. 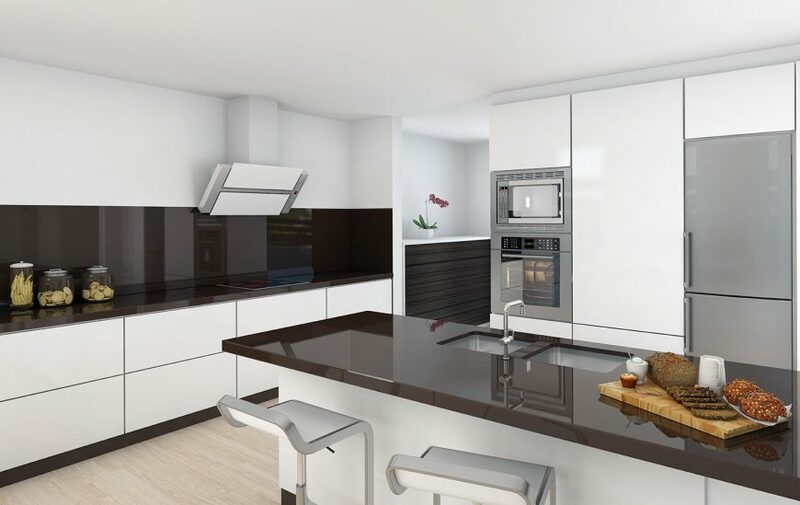 Our preassembled kitchen cabinets and engineered quartz benchtops are ideal for creating modern kitchens in Perth. Finally, traditional kitchens are the third most popular style choice for kitchens in Perth. Houzz reports that 7% of all homeowners who renovated their kitchens last year upgraded to a traditional kitchen. This is far lower than both contemporary kitchens and modern kitchens in Perth. The main reason behind this is that designing and maintaining a traditional kitchen can be somewhat difficult. Traditional kitchens make use of classic, transitional or vintage styles. Eye-catching details and extensive ornamentation define traditional kitchens. If you’re thinking of creating a traditional kitchen, make sure to plan things out properly. Traditional kitchens are all about attention to detail. You’ll also need to include extensive ornamentation to achieve this look. When designing a new kitchen, there are three main styles to consider. These include contemporary kitchens, modern kitchens, and traditional kitchens. Contemporary kitchens are sleek and stylish, and they borrow elements from traditional and modern kitchens both. Modern kitchens are minimalistic in design, and their focus is on functionality. Traditional kitchens are usually elaborate regarding ornamentation with immense attention to details. Regardless of which kitchen style you choose, you’ll find all the kitchen products you need for your renovation at Ross’s Discount Home Centre – your number 1 source for kitchens in Perth! Visit us at Guildford or check out our online store to discover our range of kitchen products today!